Not for Me: Homemade Stoned Pepper Pizza. Fully Glutenous. Someone gave us a pizza stone for our wedding, oh so many years ago. It’s a beautiful thing, sadly neglected for years in an Oregon storage unit as we spent our time in lands of rice and curry. Even now, that stone gets little attention. It tends to hide behind a stash of baking pans and trays in the dark recesses of a corner kitchen cabinet. I avoid gluten, and Jerry—empathetic husband that he is—almost always joins me in that mission. Unless we’re in somebody else’s kitchen. Or: unless I happen to be away on fellowship for weeks and months at a time. Instead, in my absence, my dear husband has fully embraced the experimental pizza and (so he says) perfected the full-on, totally glutenous homemade pizza crust. Without any nudging or nagging from me, he sent a recipe for one Stoned Pepper Pizza, his piece de resistance in these times of separate lives. Place baking stone in oven and set to 450 degrees. It will take at least 45 minutes for the stone to evenly heat, and it must be pre-heated to work properly. Proof yeast w/sugar in 1/2 cup of the warm water. Mix flours and pepper in a big mixing bowl, leaving a divot in the middle. Crack the egg into that divot, and scramble it in there. Add olive oil, mix more; add melted butter (or bacon fat! ), mix more; add proofed yeast, mix more; add more of the water as needed and mix. Fold the dough out onto a lightly floured counter top and knead for 15-20 minutes or so, adding dashes of flour and/or olive oil to keep it from sticking to you and the counter. When fully kneaded (when rolled into a ball, it almost fully rebounds when punched), cover lightly in olive oil and place in a bowl to rise until it roughly doubles in size—takes maybe 20 minutes. Take from bowl and knead again for maybe 5 minutes, then roll it out into pizza-crust shape with (my preferred tool) a wine bottle coated lightly in flour. Keep the counter coated in flour or corn meal so you can easily remove it when done. The next part has to go pretty quickly—transfer the crust to the stone. An edgeless cookie sheet works well as an oversized pizza spatula. When the crust is on the (very hot) stone, fold up any floppy corners, and poke the crust all over with a fork to prevent bubbling. Bake the crust for 5-10 minutes before adding ingredients. You can add a dusting of Parmesan cheese at this point, too. The crust should look a little cooked on top, but not browned. This step gives a hard top so sauce won’t soak in too much and make your crust soggy. Add your toppings to the pizza. The stone will remain very hot during this, so don’t worry too much if you have the oven open for a couple of minutes. Do worry about accidentally grabbing the stone with your bare hand. It should take about 15-20 minutes to finish cooking, depending on your toppings (uncooked and watery toppings obviously take longer). Before pulling it from the oven, you can hit it with the broiler for 30 seconds or so to brown the cheese—yummy! Remove the pizza from the stone to a cooling rack or (better) a cool baking sheet. You should have a hard, crispy bottom that should come off the stone quite easily (curious innuendo, that). Use thicker toppings, not thin or watery. You can cut the wheat flours with brown rice or corn flours (but still adding up to 3 cups in the end), if you so desire. *EDITOR’S NOTE: Please understand that we live at 5,000 feet, which presents a bit of a backward approach to recipe modification. Recipes are most commonly designed for low-elevation and adjusted for high-elevation as appropriate. It would take some adjusting for those living below 5,000 feet—and I honestly don’t know what might or might not work. However, here’s a good overview of the effects of elevation and air pressure on cooking. Have fun with the science experiment! Can a Civet Really Poop Out a Great Cup of Coffee? Thank you for a great simple recipe. Love your picture too. Want to come up to pur place and make one? 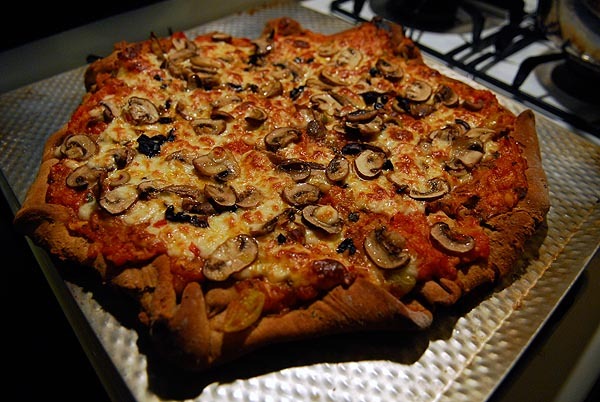 Karen, this pizza looks amazing–thanks for sharing the recipe! Thanks, everyone. Jerry really does make spectacular pizzas. Shivani, it is tempting for me, too! I’m aiming for a gluten-free version of this pizza. Gail, will I see you at the potluck?